Each day we humbly boast that “We are the Best” because we truly believe we are. From the highly-qualified teachers that cover every classroom, to the well-prepared students who walk in our halls, we believe we have been granted the best of the best. We are a community-family school that recognizes our responsibilities extend a lot further than our four walls. The parents and siblings of our children are a part of our lives. As a KYCID Banner School, our expectations are high, but our students continue to surpass the expectations set before them. Come be a part of us and make yourself at home. You will find important news and events here, but for a closer look at our day-to-day life at McNabb, look for us on social media. You can find the McNabb Facebook page here. You can find the McNabb Family Resource Center Facebook page here. You can find the McNabb Elementary Guidance page here. McNabb Instructional Assistant Chiffon Winston has been recognized as an Outstanding Education Support Alumna by the Murray State University College of Education and Human Services. Winston will receive her award at the 35th Annual Harry M. Sparks Distinguished Lecture at MSU on April 30. "Ms. Chiffon is a team player who strives to ensure students’ academic and behavioral success by working collaboratively with our teachers," said McNabb principal Teresa Spann. "She anticipates students’ needs and works creatively with our school family to find positive solutions. It’s a joy to experience the gift of education through Ms. Chiffon’s contagious giggle and grin." The MSU College of Education Alumni Awards honor educators who are advocates in their field, who often go above and beyond the call of duty to serve others, and who work collaboratively and creatively to solve problems. They are effective leaders, helpful teammates, and inspiring mentors. The Paducah-McCracken County NAACP is excited to announce the winners of the 2019 Dr. Martin Luther King, Jr. Essay and Poster Contest. In the 4th - 6th grade category, McNabb Elementary fourth grader Jakiya Starr won first place. Congratulations! In the Kindergarten - 3rd grade category, McNabb Elementary 2nd grader Amaelyn Menefee won honorable mention. Congratulations! McNabb Elementary recognized student artists whose work was chosen for the Principal's gallery at their morning assembly on December 10. This is the second round of artists chosen for the Principal's Gallery. In order to be chosen artists must do their best, show craftsmanship, and show creativity. These artists work very hard, use their time wisely and show respect. McNabb Elementary Students of the Month for November at the morning assembly on December 10. Congratulations! Jaron Anderson, McNabb Elementary School 5th grader, has been awarded the Daughters of the American Revolution Youth Citizenship Medal for his demonstration of outstanding patriotism, honor, service, courage and leadership. He is the son of Elisha Anderson. 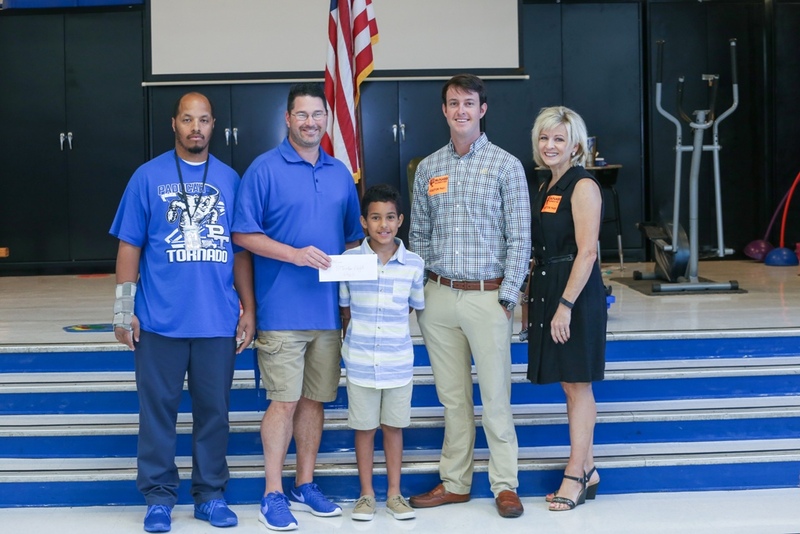 Nominated by McNabb Elementary, Anderson received a medal and certificate from Cindy Byrd, member of the Paducah chapter of the DAR, for his contributions to his school and community. Local elementary schools are taking hands-on learning to a new level with a project that is not only producing a number of little green thumbs, but also putting fresh, homegrown produce on lunch trays for the second year in a row. With the help of Tower Gardens -- vertical, aeroponic growing systems that can grow up to 20 vegetables, herbs, fruits and flowers in less than 3 square feet -- students are given the opportunity to lend a helping hand in growing the food they will later eat in their own cafeteria. 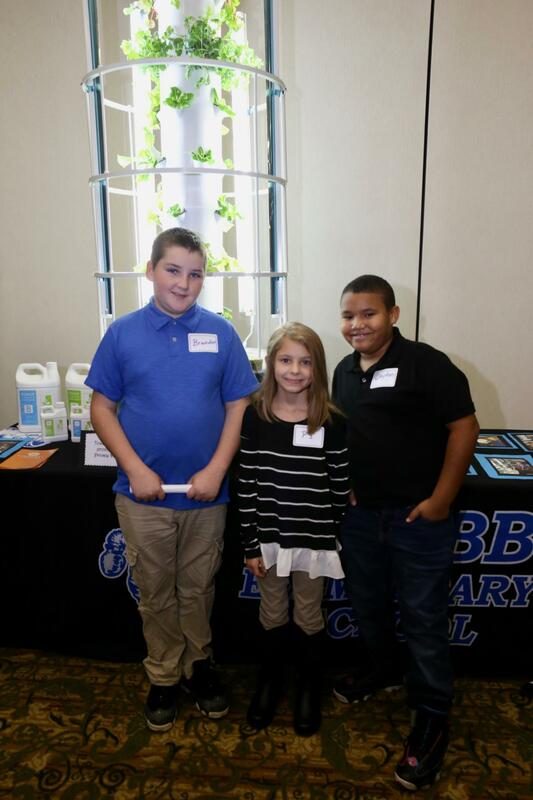 With the help of community sponsors Bonnie Koblitz and Dr. Evelyn Jones, McNabb Elementary was able to include tower gardens in its Science, Technology, Engineering, Arts and Mathematics (STEAM) curriculum last year. 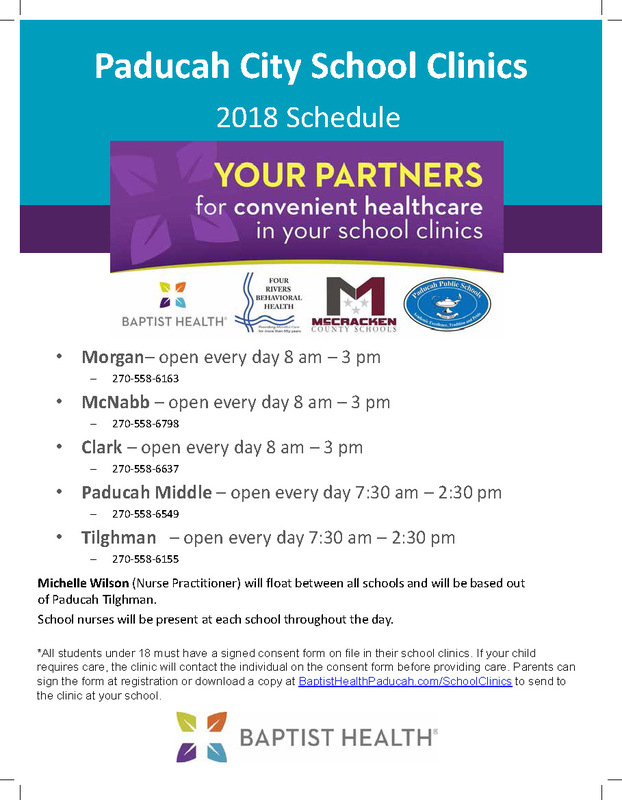 Here are the registration dates for McNabb Elementary for 2018-19. McNabb Elementary's Kids Company Too! Family Resource Center rewarded the 2018 McNabb All Stars Honor Roll Students with a visit to Mellow Mushroom on May 16. The McNabb All Stars had all A's/A's & B's twice out of the first three quarters, no behavioral incidents/referrals, and no unexcused tardies/absences!! Thanks to Sprocket & Mellow Mushroom for a good time, as well as all staff who pitched in! Downtown Kiwanis Club members recently presented bikes to McNabb kindergartener Javan Earle and fifth grader Keyiona Copeland. They were the McNabb "Read to Ride" winners for the Spring 2018 semester. "It is such a blessing to work in a district that encourages music educators to challenge students in a variety of disciplines and areas," said McNabb Elementary music teacher Natalie Krupansky. "The success of the students is a direct result of the support that the administrators give us teachers." McNabb elementary faculty Jennifer Beyer and Matt Wyman have been selected to participated in the 2018 Arkema Science Teacher Progam. They will participate in a week of hands-on science, scheduled for June 26-28, 2018 at Arkema’s manufacturing facility in Calvert City, KY. The Arkema Inc. science teachers program is for teachers in grades 3, 4, 5 or 6. The goal of the program is to bring Arkema scientists and local teachers together to spark an interest in science among elementary school students. Armed with innovative science experiment kits and the guidance of chemical engineers and scientists, teachers learn new and fascinating ways to illustrate scientific concepts. Scientific topics explored include life, earth and physical science and technology. 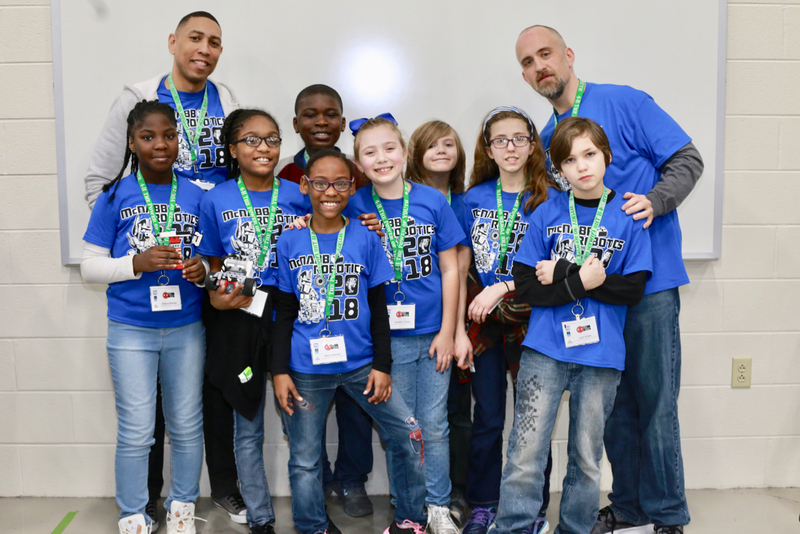 The McNabb Robotics team competed at the West Kentucky RCX Lego Robotics regional tournament held on the campus of WKCTC on March 10. Way to go, team! Students from Paducah Public Schools used posters and essays to remember and honor the life and legacy of Dr. Martin Luther King. The contest was sponsored by the NAACP Paducah Chapter, which announced the winners on January 21 at an event held at Paducah Middle School. The top three winners in each division received cash prizes. McNabb student Harmony Faulkner place third in the kindegarten through third grade division. McNabb students Braxton Patton and Brayden Hatton received honorable mention. In the fourth through sixth grade category, Byron Caldwell from McNabb Elementary received first place and Shania Robinson from McNabb Elementary received third place. Winners in seventh and eighth grade division were Jaaziah Patrick, Paducah Middle, first place; Meghan Gruber, Paducah Middle, second place; and Noland Durham, Paducah Middle, third place. 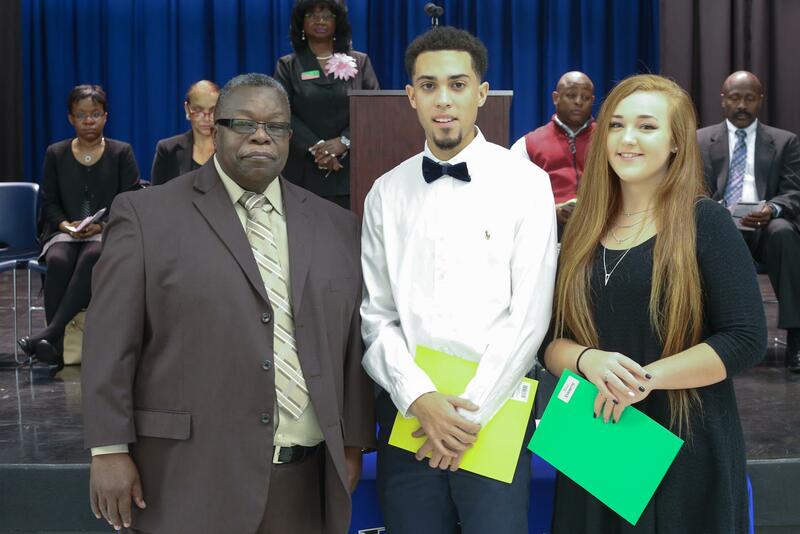 Winners in ninth through 12th grade division were Shaovion Davis, Paducah Tilghman, first place; Keyshun Curry, Paducah Tilghman, second place; and Kate Criner, Paducah Tilghman, third place. Congratulations to all who participated! To see photos of the winners, please click "Read More". Learning starts long before school. From birth, kids are building skills they need for life. This doesn’t mean they need lots of expensive learning toys! Loving relationships matter most. Parents, grandparents, and family members can use everyday moments as learning moments. Join us to learn fun activities to help your child learn anywhere, anytime! Born Learning sessions will be offered on March 15 & 29 , April 12 & 26 from 5:30 - 7:30 p.m. at 9th Street Tabernacle. Meals will be served at sessions. Families who attend all four sessions will receive a free tablet. Click "Read More" to see the flier for more info. Downtown Kiwanis Club members recently presented bikes to McNabb fifth grader McKenzie Pena and first grader Ryan Kingsley. They were the McNabb "Read to Ride" winners for the Fall 2017 semester. 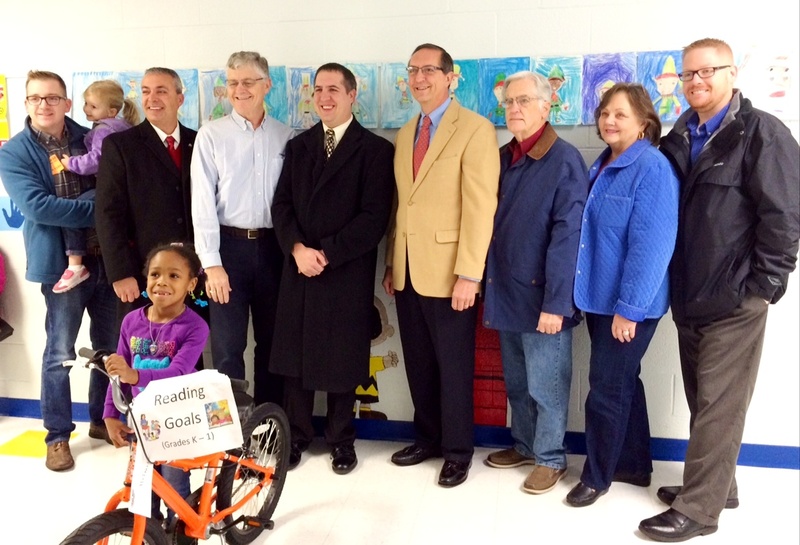 The Downtown Kiwanis Club donates a bicycles, helmets, and locks to Clark, McNabb, and Morgan elementary schools for the "Read to Ride" program. To qualify to win the bike, students take Accelerated Reader quizzes. The students' names are then placed in the drawing for each AR quiz that was passed during the semester. 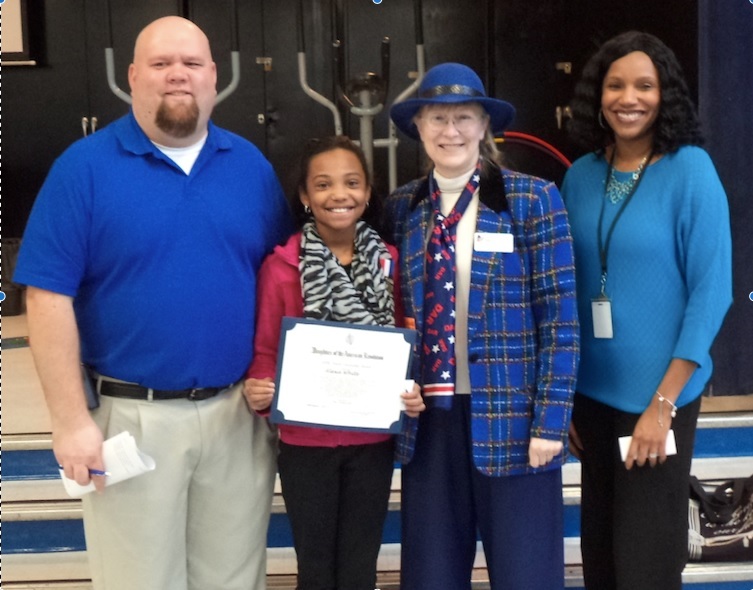 Myrikal Boyd, McNabb Elementary School 5th grader, has been awarded the Daughters of the American Revolution Youth Citizenship Medal for her demonstration of outstanding patriotism, honor, service, courage, and leadership. Click here to see the McNabb school supply list for 2017-18. 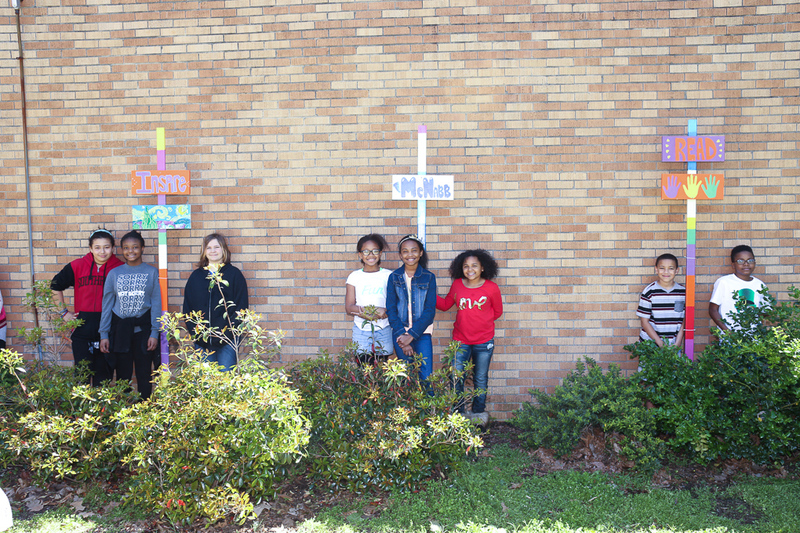 McNabb Elementary's 4th and 5th grade Art Club completed an art project to help beautify the front lawn of McNabb. The club, which met on Wednesdays, created signs with inspirational words and activities. They sketched the designs, chose the words and colors they wanted to use, and then painted the signs. 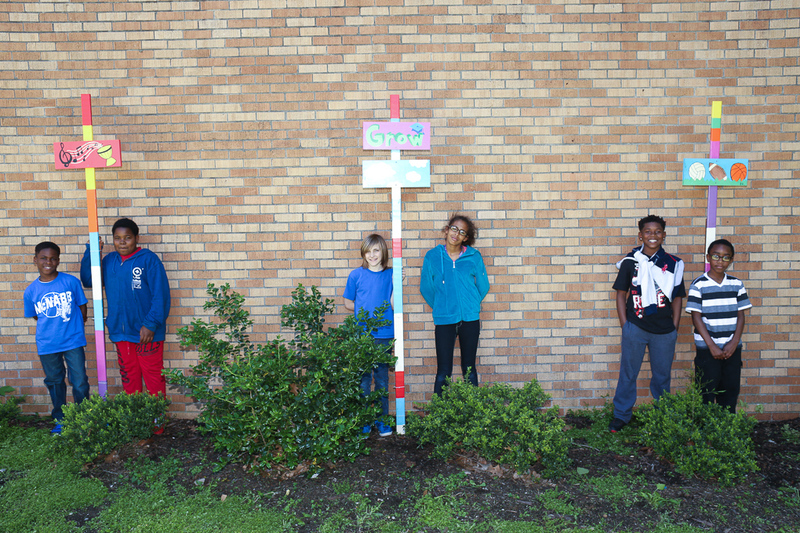 Art teacher Sierra Senn said that she hopes the Art Club can complete other beautification projects next school year. McNabb principal Teresa Spann has been named to the Board of Trustees for the Paducah Junior College Foundation. Paducah Junior College, Inc. (PJC) is the recognized foundation for West Kentucky Community and Technical College. The mission of this board is to provide resources for the improvement and enhancement of educational opportunities in support of the mission and vision of WKCTC.The PJC Board strives to cultivate partnerships with organizations and individuals that produce mutually beneficial results in raising funds for educational opportunities and services. They also provide stewardship in the responsible management of foundation assets on behalf of the citizens of the region. PTO Fundraiser Turns Coach McDermott into a "Human Sundae"
McNabb students took part in a PTO fundraiser to make Coach Mac into a human sundae. 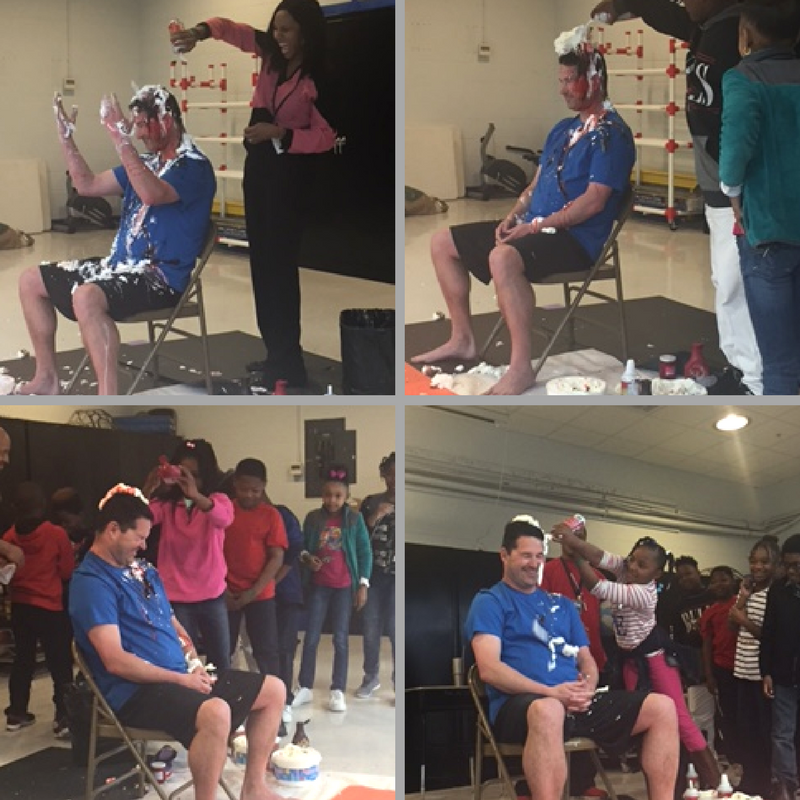 The students had two weeks to raise money, with the class raising the most money winning the privilege of turning Coach McDermott into a human sundae. Mrs. White's class won the fundraising competition. Congratulations! 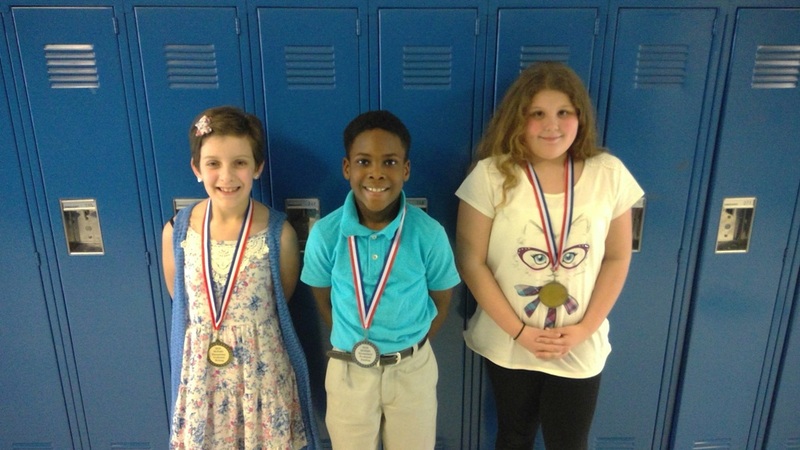 Winners of the fifth grade 4-H Speech Competition were (l to r) Madeline Walton - 3rd place, Amari Harris- 2nd place, and Kirsten Neeve - 1st place. Congratulations! Madeline, Amari, and Kirsten will advance to the county-wide 4-H Speech and Demo contest, which will be March 28 at the Murray State University Crisp Center campus. Paducah, KY - Alexa White, McNabb Elementary School 5th grader and daughter of Terrie and Andiamo White, has been awarded the Daughters of the American Revolution Youth Citizenship Medal for her demonstration of outstanding patriotism, honor, service, courage, and leadership. She is a member of 9th Street Church of Christ. Photo: DAR representative Cindy Byrd presents McNabb Elementary School 5th grader Alexa White with the DAR Youth Citizenship Medal. Pictured are McNabb Elementary School Assistant Principal Josh Payne, Alexa White, Cindy Byrd, and mother Terrie White. 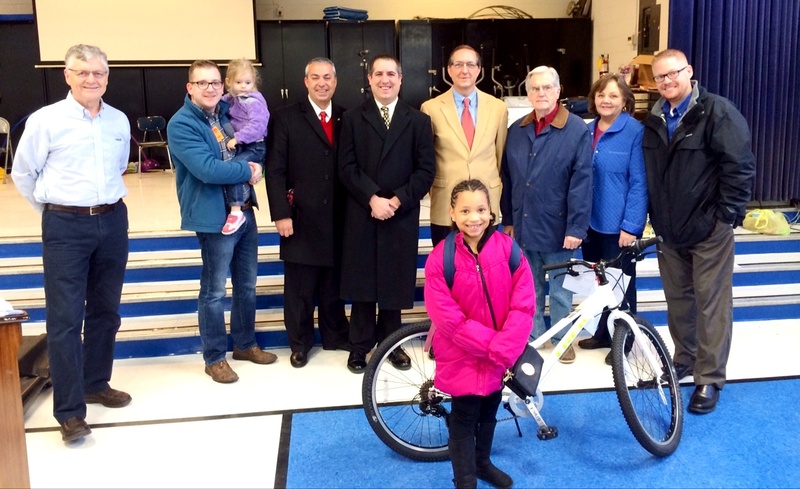 Downtown Kiwanis Club members recently presented bikes to McNabb third grader Cheyenne Caldwell and kindergartener Neriah Lincoln. They were the McNabb "Read to Ride" winners for the Fall 2016 semester. The Kiwanis Club donates a bicycles, helmets, and locks to Clark, McNabb, and Morgan elementary schools for the "Read to Ride" program. To qualify to win the bike, students take Accelerated Reader quizzes. The students' names are then placed in the drawing for each AR quiz that was passed during the semester. 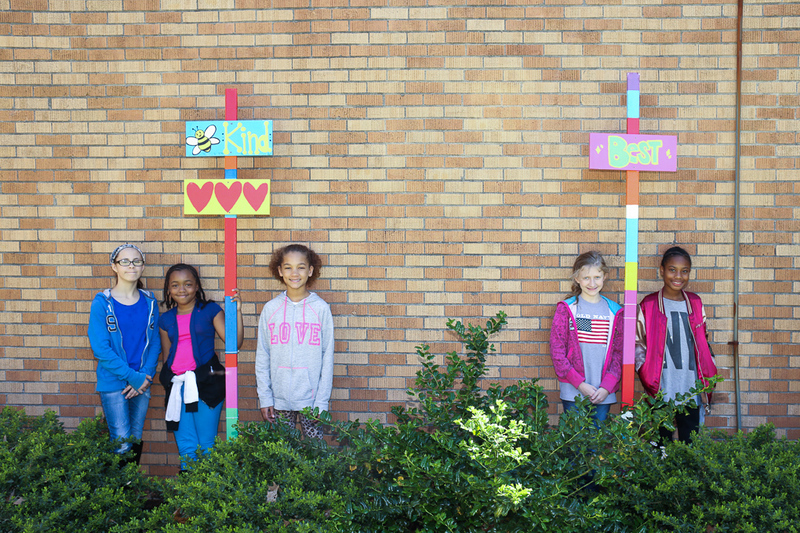 McNabb Elementary worked with Society Daughters of the American Revolution to send the most letters to military personnel in a month. We received a certificate from the president of Guinness World Records. The certificated will be in our display cabinet. The McNabb Parent and Family Involvement team and 9th Street Tabernacle invite all parents and guardians to a “Chili and Chat” evening on Tuesday, January, 31st from 5:00-6:30PM. 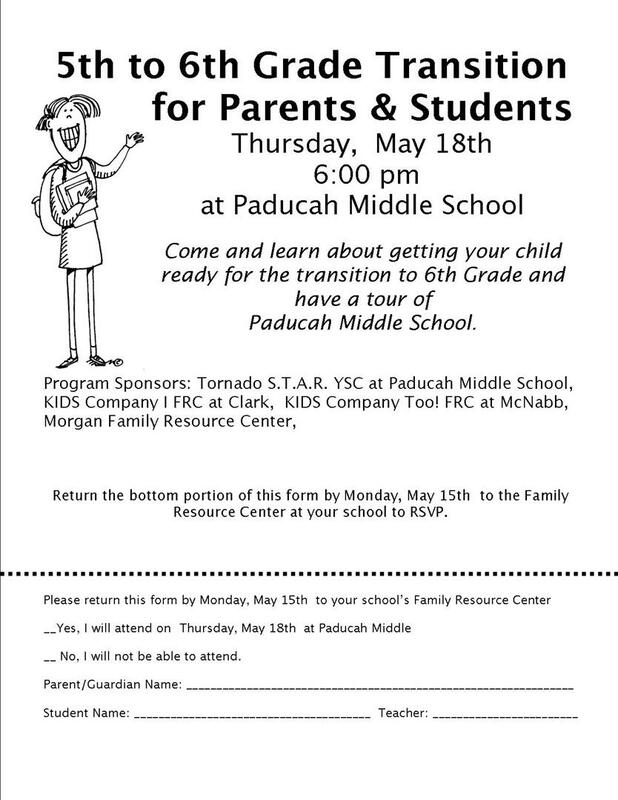 We will be talking about McNabb's Success for All program, Accelerated Reader, and testing and ways parents and guardians can help their children at home. To download a copy of the flyer, please click "Read More". 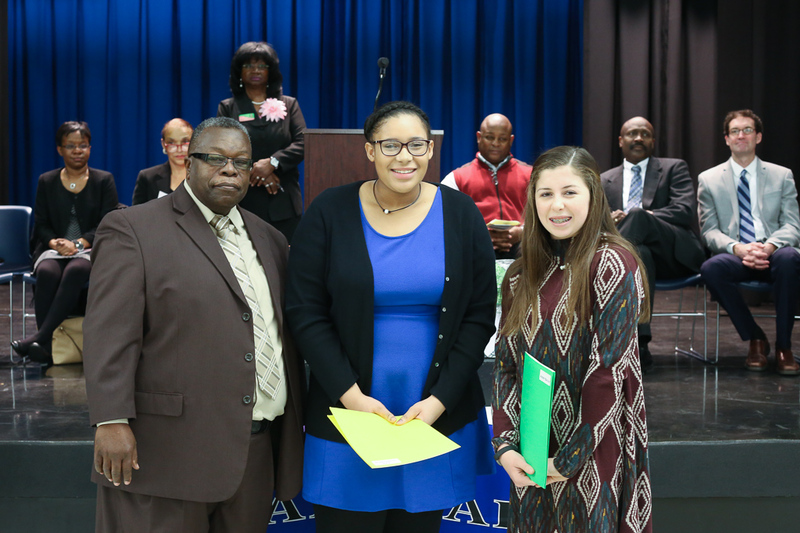 Students from McNabb, Paducah Middle School, and Paducah Tilghman were announced as award winners in the Dr. Martin Luther King, Jr. Poster, Poetry, and Essay Contest at an awards presentation held at Paducah Middle School on January 15, 2017. The event, which was hosted by the Paducah/McCracken County NAACP and sponsored by AT&T, encouraged students to creatively reflect on the life and work of Dr. King and its meaning for today’s youth. 963 entries were submitted by students from Paducah Public Schools and McCracken County Schools to the essay contest. 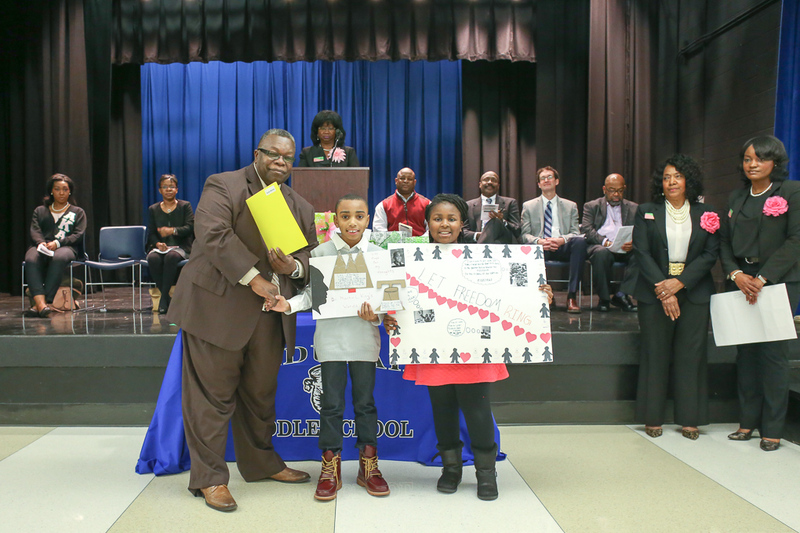 In the Kindergarten to 3rd grade poster contest, Alex White (McNabb Elementary) won first place and Jakyia Starr (McNabb Elementary) won second place. In the 7th and 8th grade essay contest, Jlea Humphreys (Paducah Middle School) won first place. In the 9-12 essay contest, Bryson Wells (Paducah Tilghman High School) won first place. Volunteers from the Paducah Power Company, Paducah Police Department, and Paducah Fire Department have been visiting Clark, McNabb, and Morgan during School Safety Week to talk with students about fire safety, electrical safety, and personal safety. 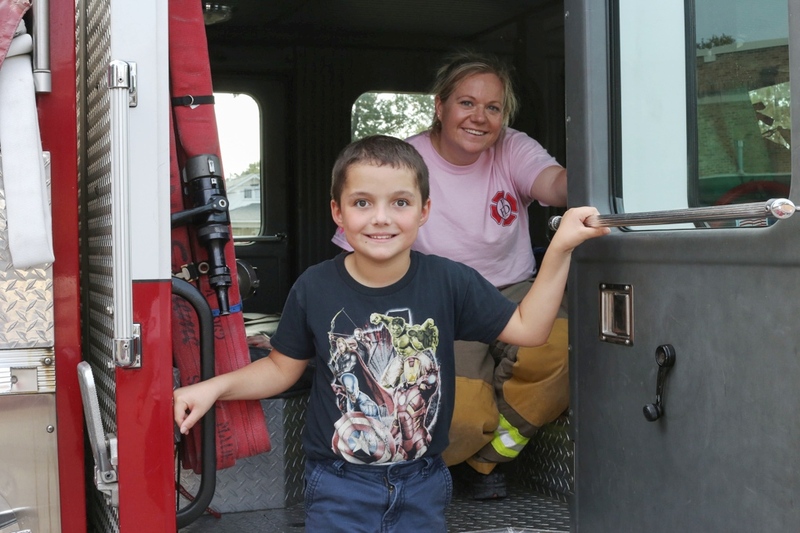 Volunteers from the fire department and Paducah Power visited McNabb Wednesday as students got to see fire trucks and power line trucks and talk with volunteers. McDonald's representatives Cathy Elliot and Michael Love were at the McNabb assembly on September 19. They presented a donation of $450 from the Teacher Fundraiser held at the Jackson Street McDonald's. The Dollar General Literacy Foundation recently awarded McNabb Elementary a $2,000 grant to support youth literacy. 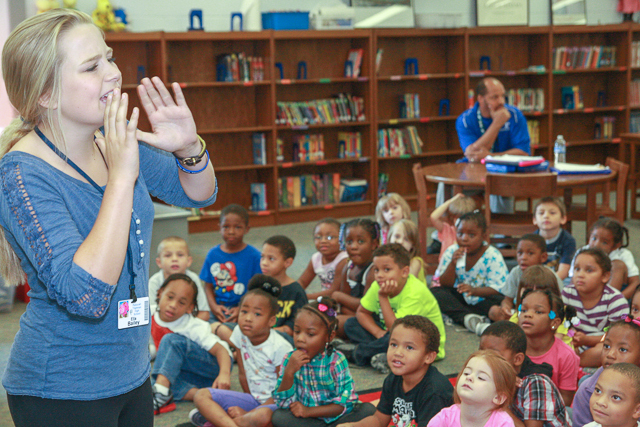 This local grant is part of $4.5 million in youth literacy grants awarded to approximately 1,000 organizations across the 43 states that Dollar General serves. 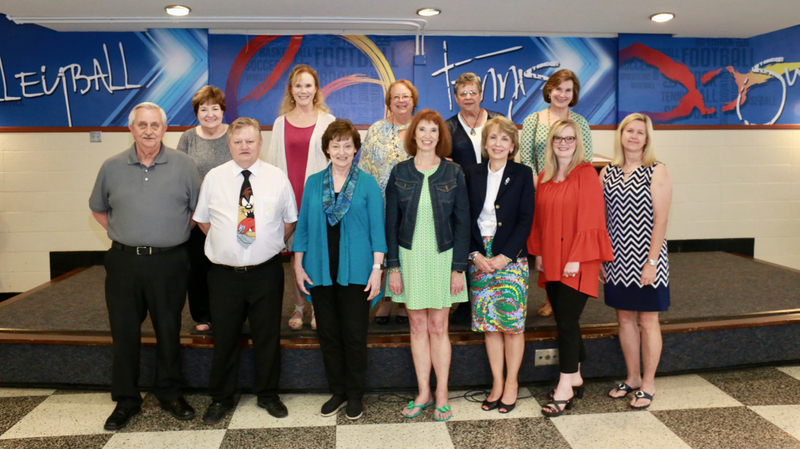 Given at the beginning of the academic school year, these grants are aimed at supporting teachers, schools and organizations with resources to strengthen and enhance literacy instruction. The grant will be used to help students in grades 3-5 set and monitor independent reading goals, engage in thirty minutes of daily independent reading, and receive close monitoring and the support of a reading teacher. 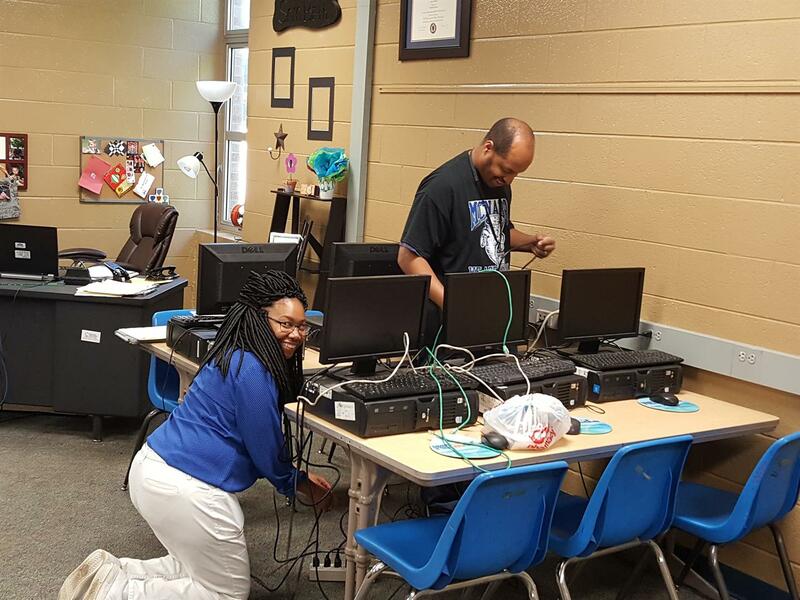 McNabb principal Teresa Spann assists Monte Hensley with connecting computers in the 21st Century office to be used during the before and after school program. Way to pitch in, Mrs. Spann! Photos from McNabb's Spring Sports Day at McRight Field on May 26 have been posted on the district Facebook page. You can see them here. McNabb fourth and fifth grade students who scored "Proficient" or "Distinguished" on last year's KPREP test were recognized at the McNabb KPREP kickoff held on May 6. Photo of the Day: Our Volunteers Are Priceless! 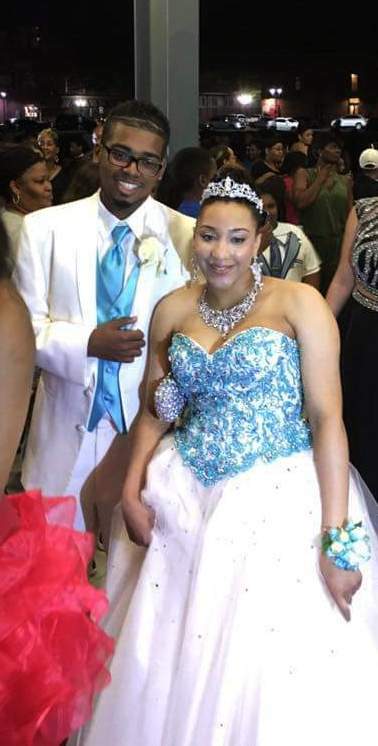 Tilghman senior and McNabb volunteer Tamia Travis arrives at the PTHS prom on April 30. Tamia assists Ms. Morris with the 2nd graders in the 21st Century after school program. We're grateful for all our community volunteers who make McNabb Elementary a great place to grow and learn. 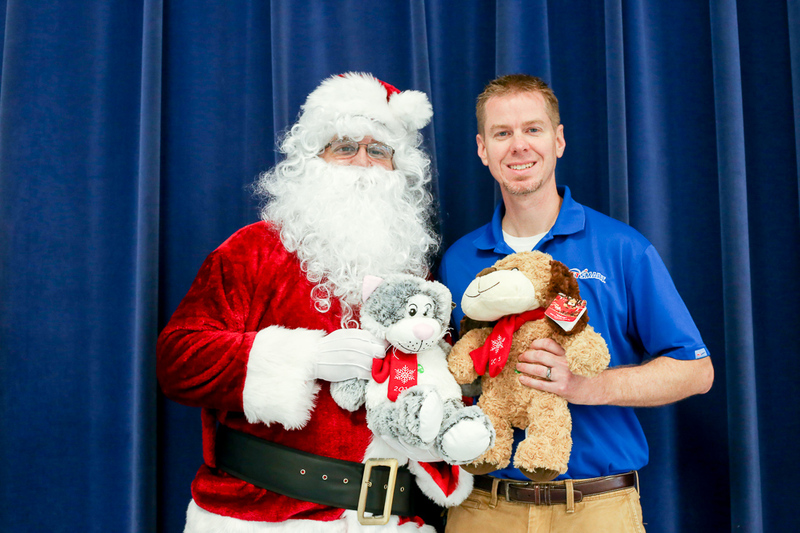 Petsmart store manager Richard Haley brought a donation of stuffed animals for Santa to share with K-3 students at McNabb Elementary on December 14. Petsmart gave its customers the opportunity to purchase a stuffed animal to share with local students at McNabb and Concord elementary schools. The Paducah store collected more donations than any other store in the region. "We are grateful for Petsmart's generousity," said Kids Company Too Family Resource Center director Stephen Bradley. "It's great for our students to have a tangible reminder of the joy that many of us receive from our pets." McNabb second grader Marle Campbell and PTHS senior Palmer Stroup won first place and six other district students had top finishes in the Veteran's Day Essay/Picture contest sponsored by the Daughters of the American Revolution. This year there are 1211 entries in the essay/picture contest; the theme was "Patriotism, Valor, and Strife". Winners were recognized at the opening ceremonies at the Veteran’s Day Parade and rode on a float in the parade. Photo of the Day: A New Place to Play! 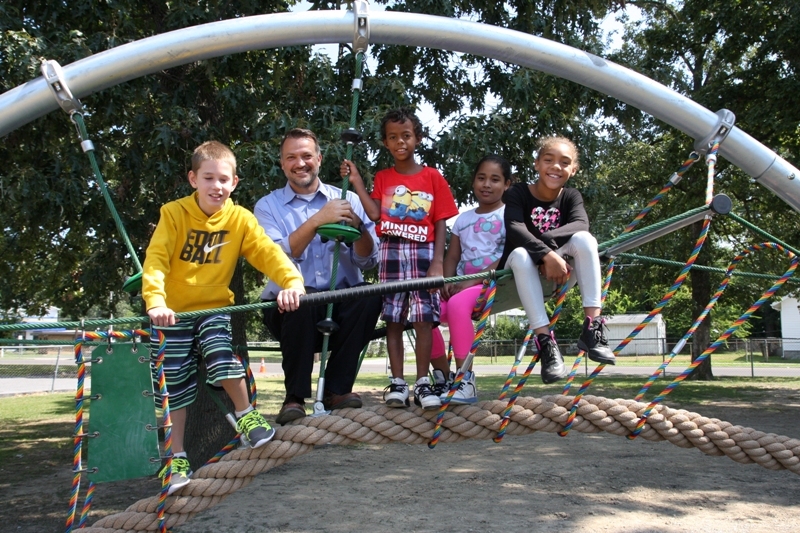 McNabb fourth graders (l to r) Jayden Mays, JaQuan Johnson, Jamilah Alfaro, and Nevaeh Troupe joined Director of Pupil Personnel Troy Brock in trying out a new piece of playground equipment that has been installed at McNabb Elementary. The new installation is the first step in multi-phase project that will revitalize the McNabb Elementary playground. The Kentucky Department for Public Health issues these safety guidelines for after floods. • Avoid contact with flood waters. Flood waters are unclean and can be a risk for tetanus for those who have open wounds that come into direct contact with them. 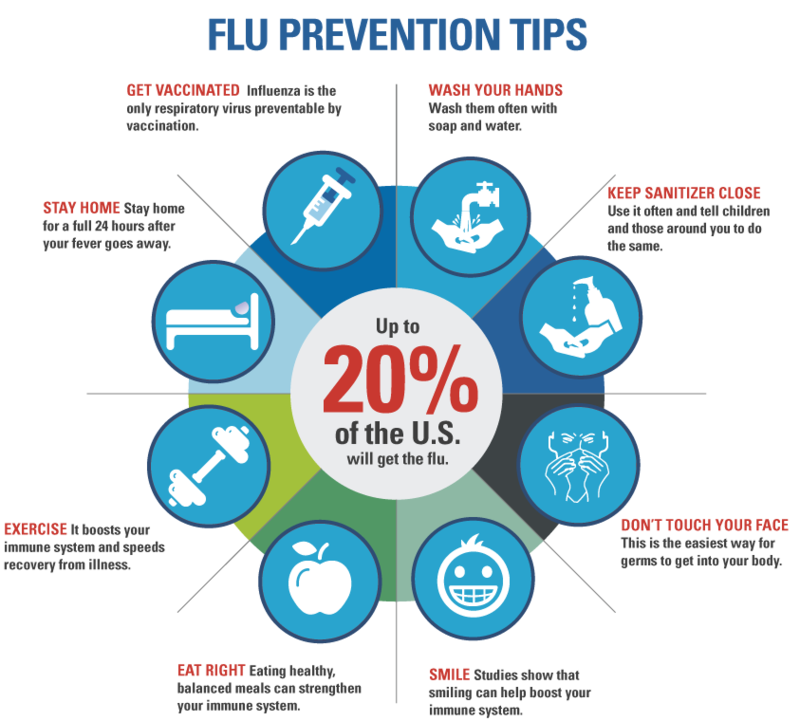 Contact your regular health care provider or your local health department if you believe you may need a tetanus shot. McNabb Elementary math and science camp students concluded their camp by hosting their annual lemonade stand on June 12. The lemonade stand is a final project of math and science camp at McNabb. The lemonade stand project was started in 2009 and this year's students have continued it, using math skills they have learned to research the business, construct the lemonade stand, make change, and mix the drinks. Funds raised will be used to support student activities in the 2015-16 school year. McNabb students and staff dressed in blue today to celebrate the last day of Child Abuse Prevention Week, which featured different dress up days.Today's theme was, "Chase away the blues of child abuse." 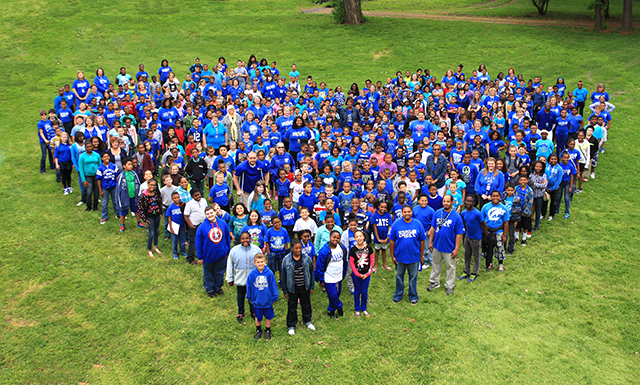 Students and faculty gathered together in the shape of a heart at the end of the school day. Congratulations to all of McNabb fourth, fifth, and sixth graders at Paducah Middle who were honored for their achievement on the Kentucky Performance Rating for Educational Progress (KPREP) at McNabb on March 13. We are proud of you! You can see photos from the event here. 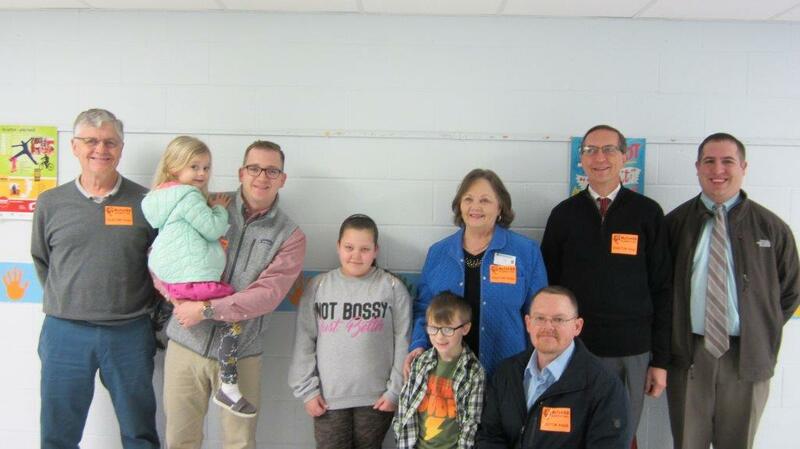 The Junior Achievement (JA) Board of Directors for Four Rivers Counties and representatives from US Bank met at McNabb Elementary on January 22 to kick off the Junior Achievement program in Paducah Public Schools. "We are pleased to bring Junior Achievement to Western Kentucky and begin this partnership with our schools," said JA West Kentucky President Dan Douglas. "We are serving 21,000 students in West Kentucky with the goal of ensuring that every student has a fundamental understanding of financial literacy, work-readiness skills, and entrepreneurship." 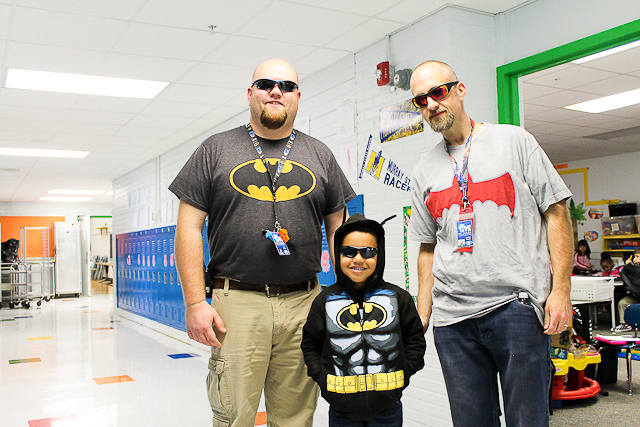 Matthew Wyman, Josh Payne, and Kindergartner Clayton Eidson dressed up as Batman for Twin Day at McNabb Elementary as a part of their celebration of Red Ribbon Week. District Schools are celebrating Red Ribbon week October 20-24 with door decorations, poster contests, and dress-up days, encouraging everyone to live drug-free. Red Ribbon Week is the oldest and largest drug prevention campaign in the country. It serves as a vehicle for communities and individuals to take a stand for the hopes and dreams of our children through a commitment to drug prevention and education and a personal commitment to live drug-free lives with the ultimate goal being the creation of drug-free America. You can see photos from Super Hero day here. 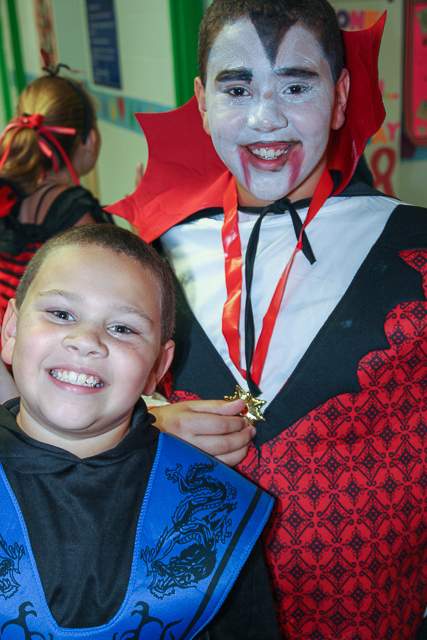 McNabb students and parents had big fun at the McNabb Fall festival on October 30! You can see photos from the evening here. 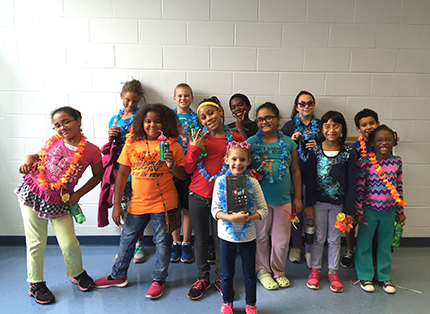 McNabb Elementary math camp students concluded their camp by hosting their annual lemonade stand on June 12. The lemonade stand is a final project of math camp at McNabb. The lemonade stand was started in 2009 and this year's students have continued it, using math skills to research the business, construct the lemonade stand, make change, and mix the drinks. Funds raised will be used to support student activities in the 2014-15 school year. Photo of the Day: McNabb Head Start Makes Pumpkin "Pi"